Greenwich-based brewer Meantime has opened Britain's smallest craft beer bar, named 'Make Time for It', aiming to give members of the public a break from digital distractions. The bar, located on Peninsula Square in North Greenwich, opens tomorrow (21 October) and measures just 6ft by 8ft – smaller than the perimeter of a snooker table, with space to accommodate just three people at a time. Entry is free and members of the public can pre-book a time slot or simply turn up on the day to experience the bar. Guests will be treated to a free beer of their choice whilst inside the bar, where they can also enjoy bespoke crafted items on display, specially produced to create the ideal watering hole. Visitors will also leave with a bespoke personalised bottle of Pale Ale. Doors will open on the 21st October 2016. The Meantime ‘Make Time for It’ bar has been designed in collaboration with six of the country’s finest craftspeople as part of the ‘Make Time For It’ campaign. The bar offers the public an opportunity to take a break from their busy lives and digital distractions, with mobile phones handed over to the landlord prior to entering the bar, encouraging visitors to take time together over a drink. Rich Myers, marketing director of Meantime Brewing Company, said: "The ‘Make Time For It’ campaign was designed to highlight the importance of time, the fifth ingredient in our beers, as well as celebrate the best of British craft from across the country. The bar was designed to help create the perfect drinking environment – a space to appreciate craft in a variety of forms and the perfect spot to spend time catching up with a mate over a beer. We’re also exploring the idea of sending the bar on tour around the country, made possible by the fact that it fits comfortably in a Transit van." The bar itself features wallpaper that has been designed by Marion Parola and Yvonne Elliott of Bespoke Atelier in Glasgow, while all the pint glasses on display have been hand blown by James Adlington of Bristol Blue Glass. While enjoying a pint, customers will be seated on a unique bar stool created from recycled brewing waste by furniture designer Liam Hopkins of Lazerian, based in Manchester. Those visiting the bar can also bask in the glow of a bespoke neon installation created in Leeds by Julia Bickerstaff of Neoncraft. 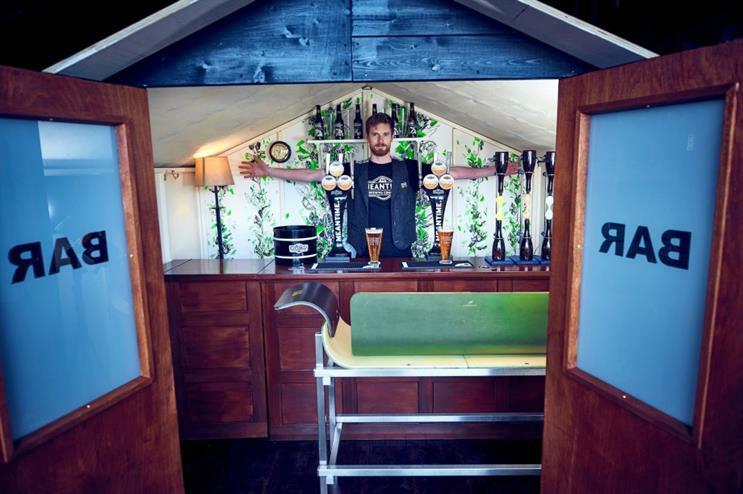 Meantime hosted a virtual reality tour of its brewery at this year's On Blackheath festival.